In summer 2017, Lego will release a new space shuttle kit, the Lego Creator Space Shuttle Explorer. The building set was unveiled at New York Toy Fair 2017 Saturday, Feb. 18. NEW YORK — Lego has a new space shuttle set for 2017 and it promises to be one any space fan can enjoy. 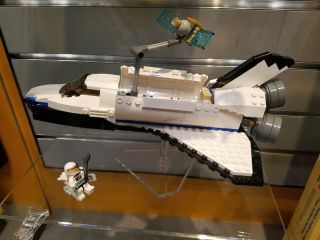 We got a close-up first look at the new Lego Creator Space Shuttle Explorer 3-in-1 set at the New York Toy Fair 2017 Saturday (Feb. 18). It's a 285-piece set under Lego's Creator line, which encourages creativity through multiple builds. It will be available this summer for $29.99. At first glance, there are some clear design departures from past Lego shuttle kits, which ranged from the relatively small Utility Shuttle of 2015 to the massive Spaceport set from that same year. Unlike other recent Lego shuttles, which used large canopy pieces for the nose and big fins for the tail, Space Shuttle Explorer features a brick-built nose and tail made of sloped and curved pieces to give it the angled shape of a reusable spaceship. The tail also has some limited articulation and can be moved up and down. The 2017 Lego Creator Space Shuttle Explorer set can also be used to built a space base and a rover, as seen in the box art inserts at right. While the shuttle looks to be a solid build on its own, the pieces in the Space Shuttle Explorer set can also be used to make two other models. One is a rover suitable to roaming whatever brick planet your child (or you!) can dream up. The third build is a planetary base where your astronaut minifigure can plan the next voyage across the brick frontier. According to Lego representatives, Space Shuttle Explorer will be available Aug. 1. It's a perfect companion to the Lego Creator Robo Explorer, a 3-in-1 robot building set that can be rebuilt into a robot dog and bird. The Robo Explorer was released in January.